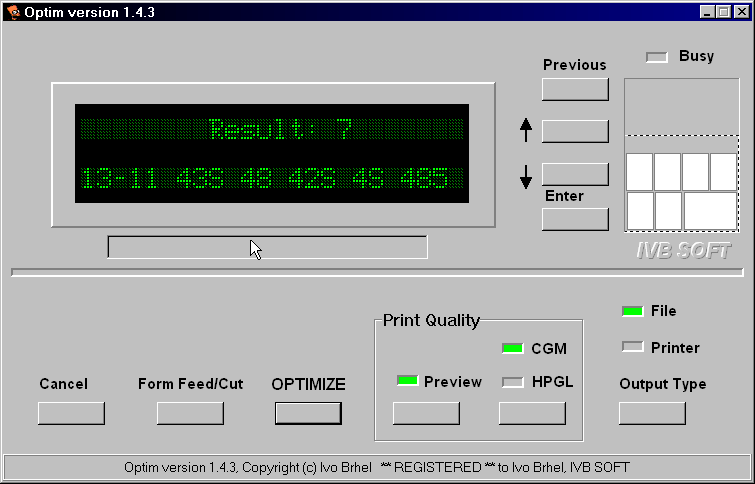 For optimal use of the print media area when printing large format printers (plotters), Optim can be used. The program works with rectangular objects (drawings) by trying to place them on the specified area as efficiently as possible. The appearance of the application resembles the plotter control panel. It is similar to a large-format printer (plotter). You can set the size of the print media, the distance between individual drawings, the print pen thickness. The program works on the basis of the minimal waste of the print media algorithm. For statistical purposes, data about the processed formats is written to the xls file. The plan is to add the possibility of simultaneous processing of cgm and hpgl files.